Presidential elections in Peru: are climate policies on the line? As voting polls closed yesterday in Peru's second round of Presidential elections, much uncertainty remains with regards to how the coming administration –whomever that will be– will address Peru’s commitments and need to tackle the climate challenge. The striking lack of clear proposals from both running candidates to direct Peru towards cleaner and more resilient development –particularly to incentivize investments in renewable energy– bring into question where the mitigation and adaptation commitments that Peru had taken in line with COP21 will fall, and what development path the country will follow in the coming 5 years. The second round of presidential elections held yesterday was a highly contentious one: the latest polls published before the elections showed that Keiko Fujimori of Fuerza Popular (Popular Force) and Pedro Pablo Kuczynski of Peruanos Por el Kambio (Peruvians for Change) –who got first and second place respectively in the first round of elections in April– were virtually tied. Earlier today, at 91% of processed ballots, Kuczynski kept a narrow advantage with 50.32% of votes against Keiko's 49.68%. The difference between the candidates is of barely 103,000 votes, and with 9% of ballots left to count it is still too early to announce a winner and a loser. The electoral climate throughout these last few months has been equally controversial, particularly as a large percentage of Peruvian voters remain disillusioned with the options at hand and the electoral process carried out. Indeed, during the first round the number of absentees and null and blank votes was higher than Keiko’s votes –the winner of the round. Moreover, the backlash and “anti-votes” that both candidates face have pinned them in a dirty war to discredit one another, an attempt to win the support of those who will be voting for who they consider the lesser of two evils. Indeed, anti-votes for both candidates run high. On May 31st, barely 5 days before the elections, 70,000 people convened in the streets of Lima’s historic centre in a manifestation against the candidacy of Keiko Fujimori. Her anti-vote is the strongest, as 43% of Peruvian voters say they would “never” vote for her. This is not surprising, as Keiko is the daughter of ex-President Alberto Fujimori (1990-2000), currently serving a 25-year sentence for crimes against humanity and corruption committed during his administration. Keiko also served as her father’s First Lady, and owes much of her current support to his legacy and popularity. Many Peruvians fear that Keiko’s election would lead Peru towards becoming a “narco-state”, and roll back the progress made to re-build the corroded democratic institutions that Alberto Fujimori's autocratic regime left behind. Meanwhile, Kuczynski’s anti-vote rises to 40%, and out of those who will vote for him 39% are doing so only as a way to prevent Keiko from winning, not out of conviction. Many voters see Kuczynski –who has a clear neoliberal, pro-business stance– as untrustworthy, particularly due to his foreign roots (as an American passport holder, to which he renounced late last year) and his age, according to an April poll. 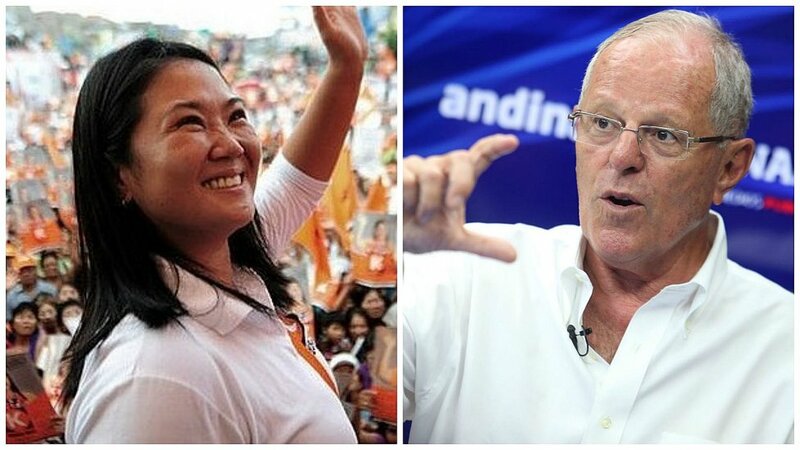 Kuczynski has also been criticized for his political opportunism: while during the 2011 elections he supported Keiko’s candidacy (having failed himself to advance to the second round), he has now turned his stance upside down and affirms that Keiko’s administration would be a threat to democracy and the return of an authoritarian and corrupt government. Kuczynski supporting Keiko Fujimori's candidacy in the 2011 elections. Peru’s next president won’t be known until all votes have been counted. Yet, regardless of who will take the presidency, it is clear that Peru will be led by a neoliberal, right wing government that thus far has provided little evidence of having a commitment to build a cleaner and more resilient economy in the years to come. With a prolonged economic recession and with crime and insecurity solidly at the top of citizens’ concerns, climate change and sustainable development have seemingly fallen to the bottom of the priority list and been largely absent from the political debate. This is concerning, not only because Peru is a highly vulnerable country to climate change that cannot afford not taking action, but also because of positive steps it had recently taken, which include a recently adopted National Strategy on Climate Change (in 2015), a commitment to a 30% GHG reduction in line with COP21, and the signing of the Paris Agreement in New York earlier this year. These goals and initiatives, unfortunately, have hardly been addressed by the candidates, Fujimori and Kuczynski included. Fuerza Popular’s (Fujimori’s party) government plan severely overlooks climate policies and targets. Shockingly, the term “climate change” does not appear even once in their 70-page plan. Renewable energy gets only one brief mention as does the COP21 in this respect, yet without any targets for the further incorporation of renewables to the energy matrix nor means to incentivize investments in this sector. Fuerza Popular’s proposals for the management of the Amazon forest equally leave many questions unanswered, as their main focus is that of increasing the productive potential of forests and developing a wood industry, which they argue is exploited below its potential at the moment. The plan sees “sustainable forests” through an extractive lens that aims at increasing their productivity, overlooking the severe issues that Peru has with illegal logging and deforestation. GHG mitigation is only briefly mentioned in the context of carbon trading mechanisms that Peru could take advantage of through its forests, although again there are no further details or discussion provided. Fuerza Popular’s proposal for sustainable forests makes no reference to Peru’s mitigation pledge to the UN (a 30% GHG reduction to 2030), of which more than 50% of actions are to be taken within Peru’s forestry and land use sector. Risk management and adaptation measures are also left undiscussed. Kuczynski’s party Peruanos Por el Kambio (PPK) presents a more solid proposal with regards to climate change, although it still largely lacks a discussion on the growth of the renewable energy sector and framing climate change as a cross-cutting economic, political and social issue. PPK’s proposal stands out for promoting the approval of a Framework Law on Climate Change that would engage a variety of ministries and stakeholders (such as the private sector) to englobe mitigation and adaptation actions. PPK’s strategic lines to address environmental issues also include the conservation and sustainable management of forests and water resources, a nation wide program to manage solid waste, and the promotion of responsible, low-scale mining. Nonetheless, the proposal on climate change does not adequately address the country’s transition to a low-carbon economy, even though the intention of promoting clean energy is briefly stated. On this front, PPK’s proposal aims to continue with Peru’s 2008 energy law to increase the share of renewables in the matrix to 5%. This goal, however, was meant to be reached by 2015 and had barely reached 2% by 2013. Thus, PPK’s proposal does not seek to further advance Peru's transition to renewables nor increase ambition, failing to present new targets and means to reach them. PPK’s proposal on climate change is consistently more thorough than Fuerza Popular’s, yet it is evident that both need to show a clearer and firmer commitment to take climate change issues seriously and as a cross-cutting issue in their social and economic policies. Neither, for example, presents proposals for more sustainable transportation and resilient cities. Proposals regarding the energy sector still largely hinge on exploiting Peru's gas and oil reserves, while renewables do not stand out as a priority for energy policies. It is also striking that, while both proposals mention some of the Sustainable Development Goals, they don’t do so with regards to climate change adaptation and mitigation. It would thus seem that both parties still do not recognize the close linkages between development, human security and climate change –and this is key for a country that is as vulnerable as Peru. Future climate policies that Peru may take are not only reliant on the next elected President, as the Congress has already been configured in the first round of elections. Fuerza Popular took 73 out of 130 seats, winning an absolute majority. This, certainly, has raised concerns over the power that Keiko would hold in her eventual election, and the difficulties in ruling that Kuczynski would have as President if his party does not build stable coalitions in congress, as they only hold 18 seats. The developmental policies that Peru will adopt in the following 5 years thus hinge on the political configurations within the Congress and in its relation to the Executive. Beyond the results to be unveiled once all votes are counted in the following days, it is clear that an active citizenry will be essential if Peru is not to lose its way and veer away from the path towards a more resilient and cleaner economy that it had very slowly started to walk towards. Targets and commitments have been established in the last couple of years, and the coming administration needs to be one of concrete actions if Peru is to reach its objectives and adapt to dawning climate threats. A strong civil society movement will be key in such a critical political juncture that highly necessitates accountability.